Because yes, our vineyard is unique! Unique in its altitude and its unevenness: set at about 360 metres, it is one of the highest in Alsace... but also one of the steepest! 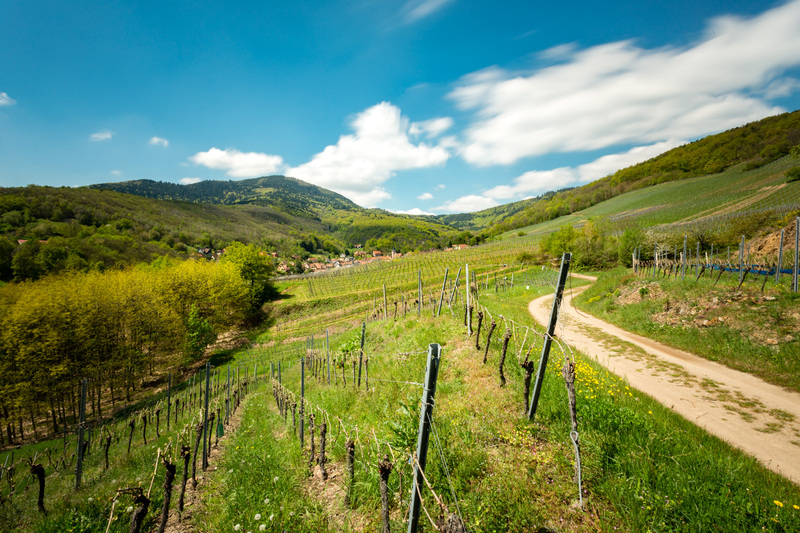 Its microclimate is also unique: optimal sunshine and limited wind for vines which seem to be protected with kindness by the Ungersberg mountain from its 901 metres height. Unique, ultimately due to its terroirs. In the southern part of our vineyard, Steige schist has been around for 500 million years... A light and airy soil and one that drains and heats quickly. The vines make their way between the stones, taking advantage of all the minerals offered to them to fill their fruit with very particular aromas, mixing mineral and fruity. To the south-east, pink sandstone offers a sandy-sandstone soil, a guarantee of the finesse and subtlety that characterises our wines. BWell aware that our vines draw their strengths and characteristics from the environment in which they thrive, we are committed to preserving this so generous nature. For us, eco-sustainability is essential: thanks to total grass cover (or at least 1 out of 2 rows) and the supply of plant humus, we take care in particular of micro-organisms. Ladybirds, bees and flowers are also welcome in our vineyards. It is with pleasure that we let them settle in the spring of each new year. Reflecting the very specific soil that nourished it, our wine reveals its peculiarities: dry and fruity, our wines give off an elegant finesse with an interesting and rare minerality. Maybe it was already them that created the excellent reputation of Reichsfeld wines in the 12th century. Those which led them to be exported to Sweden very quickly?